Apparently spring only lasts for one day around here. The high 60’s of yesterday gave way to wind and clouds and rain – there may be no planting today. Instead, KC the Bride is coming over later to crank out more table runners. She is getting married in August in her parents’ backyard and has a vision for the tables. She plans to layer table runners done in blues in the True Lover’s Knot block on top of vintage lace. An ambitious plan, given that she a) hasn’t sewn much and b) is doing it on her grandmother’s sewing machine. So we will spend this blustery day making things. I’m browsing some of my favorite books, trying to find a project, probably a bag of some sort using some of these awesome fabrics and buttons. 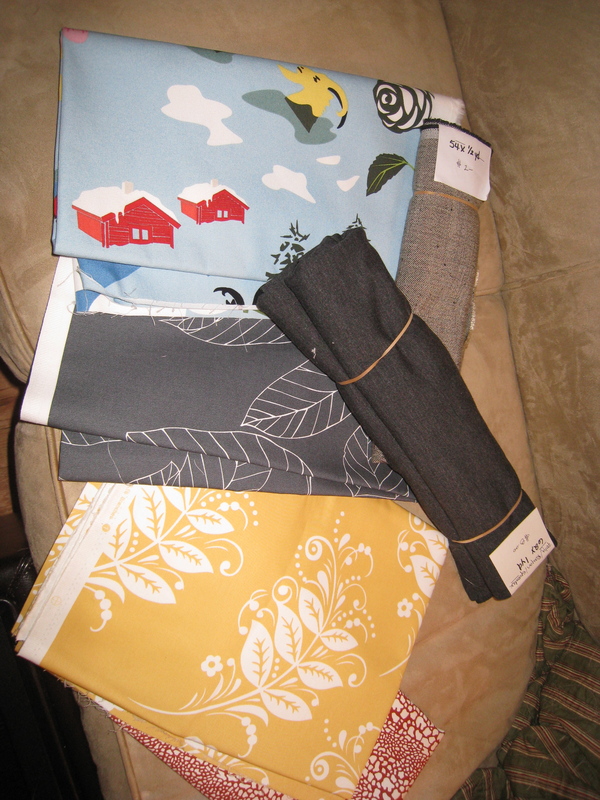 IKEA is a fantastic place for fabric, big pieces for not a lot of money. The gray print and the blue came from there, for like $8! 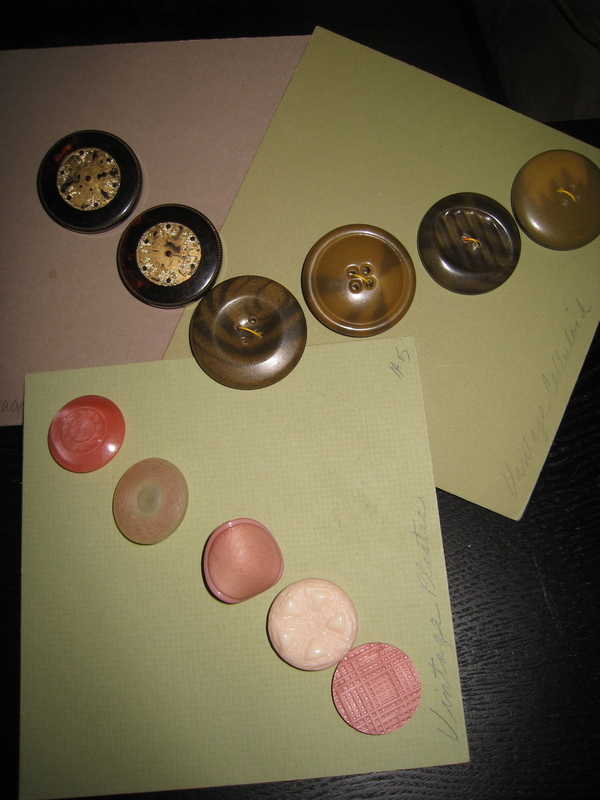 The vintage buttons and rolled fabric came from the Beppa fabric sale, also super cheap. As for patterns/construction ideas, I have a few go-to books curently. Fabricate has lots of unique construction ideas for all sorts of things, and encourages you to think outside the box. For lots of useful projects, I like The New Handmade. Someday when I’m feeling especially ambitious I will make the messenger bag. But my current favorite bag pattern book is The Perfect Handmade Bag. SO many cute bags! She emphasizes using recycled materials, like felted sweaters (pick up for a song while thrifting, or your husband accidentally shrinks one and even your daughter can’t fit it). And of course, there’s always Amy. Stinking cute bags and tunics! This time though, I think I will try to make a version of a bag I saw at the Beppa sale. No pattern, but it didn’t look that complicated. Keep your fingers crossed. And if you happen to know anyone who’s going to the beach with me next weekend, you might mention there could be a bag in their future, should they happen to purchase some fabric. I’m just saying.